Anjon Submersible Pumps Proudly offering direct drive, asynchronous and mag-drive pumps. 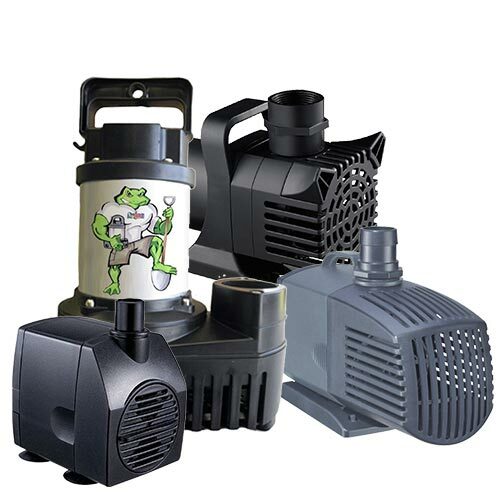 Choose from the ever popular powerful Big Frog Pumps for waterfalls down to the Tadpole line for smaller applications with spitters and fountains. Anjon Big Frog ECO Drive Waterfall Pump are low energy, high flow, energy efficient hybrid drive pump. Each Big Frog pump can chop up solids 1/4". Each Big Frog unit come with high quality seals for long and efficient pump life. Each pump is low energy, which saves you money and electricity. The Anjon Big Frog pump comes with an overload sensor that prevent pump burnout. The Big Frog pump engineered for 24-hour continuous use. It contains no oil, so it is aquatic plant and fish safe. The Big Frog pump comes with a 2-year warranty. The low suction point is ideal for clean-outs and draining. Anjon Flood Mag drive pumps are extremely energy efficient magnetic drive pumps. These units are extremely energy efficient and can be mounted vertically or horizontally. The tough vortex impeller passes solids up to ¼”. This pump features an overload sensor that prevent pump burnout. Anjon flood mag drive pumps are engineered for 24-hour continuous use. The Anjon flood mag drive pumps contain no oil, so they are aquatic plant and fish safe. Each pump comes with a 2-year warranty. Tough vortex impeller passes solids to .25"
Monsoon pumps feature high flow, energy efficient hybrid drive pumps. These units are engineered for 24-hour continuous use. Each Monsoon unit come with high quality seals for longer and efficient pump life. These pumps contain no oil, so they are fish safe. Monsoon pumps are for in-line and submersible applications. Monsoon pumps pass solids up to ¼" in diameter. All Monsoon pumps come with a full 2-year warranty. Monsoon pumps feature an overload sensor that prevent pump burnout. Monsoon pumps can be mounted vertically or horizontally.